If we look at the book of Tattvabodha, we will see that none of the above topics are covered in Tattvabodha. The text book Tattvabodha assumes that a student of Tattvabodha knows all the topics that we have already discussed. They are all taken for granted in this particular book. In fact they are implicitly contained in Tattvabodha. Now that we are familiar with these topics, we can enter into Tattvabodha summary proper. Tattvabodha is a book which primarily focuses on Jnāna Yoga spiritual discipline or self enquiry. Unlike the Bhagavad Gītā which is a complete and comprehensive text book because it deals with Karma Yoga, Upāsana Yoga and Jnāna Yoga, Tattvabodha deals only with Jnāna Yoga. This book Tattvabodha is generally studied because it presents the method of self enquiry in a systematic and comprehensive form. Self enquiry is presented in a systematic and comprehensive form and this Self enquiry leads to self knowledge or self discovery. This is the subject matter of Tattvabodha. This book Tattvabodha is written by Shankarāchārya but not ascertained if it is Ādi Shankarāchārya. And this is a small book only in prose form. Some of the scriptural text are in metrical form (poetry) which can be chanted. but Tattvabodha is in prose form except for the beginning and end. It begins and ends with prayers. With this background information, we will enter into the first topic of Tattvabodha. The textbook begins with the qualifications required for Self enquiry. What are the preparatory qualification or preparatory disciplines required for Self enquiry. This is also to be understood very well, because the study of any science presupposes the appropriate qualification. Without appropriate qualification, one cannot enter into any field. This is true of Self enquiry also. This qualification is presented as Sādhana Chatushtaya Sampattihi. Sādhanām means qualification and Chatushtayam means preparation. Hence Sādhana Chatushtaya means fourfold qualification or fourfold preparatory discipline. This can be translated into English as discrimination. Here we use the word discrimination not in a negative sense as in racial discrimination, gender discrimination etc. In the negative sense it is used to refer to partiality or favouritism. But in the scriptural jargon the word discrimination is not in the negative sense, here it means the sense of judgement, right judgement, right understanding, discernment. Nitya Anitya Vastu Vivekaha – understanding of what is Anityam or impermanent and Nityam or permanent. Therefore differentiation of the impermanent and permanent, differentiation of the ephemeral and eternal is discrimination. How are we to understand this ? If you look at the universe, we discover one fact that the whole world or creation exists within time - space frame. Therefore no object in the creation is beyond time and space and everything is subject to onslaught of time. Onslaught of time, or every object is attacked my time means every object is subject to birth and consequently subject to death also. And since I do not experience anything beyond time, I can say the whole creation is impermanent or ephemeral or perishable in nature. Thus perish-ability or fragility is the intrinsic nature of the entire creation consisting of things, beings, situations and relationships. There is no permanent object, permanent person or permanent situation and above all there is no permanent relationship. And since the whole world is perishable, it can never give lasting security or support. Nothing in the world or entire world can give me lasting security or support. So if I am going to expect lasting security or support from the world, my expectations are not going to be fulfilled. Disappointment will be the result. Therefore right judgement is – never depend on the world, never rely upon the world for lasting security and support. The world cannot give it – Anitya Vastu cannot give it. That does not mean that the world is useless or that the world should be rejected. The world can give a lot of things and certainly you can use the world for a lot of things. World can give you entertainment, education, opportunity for service, opportunity for growth. But when it comes to lasting security and support, leaning on the world is risky. That is why we have the example of the cardboard chair. We have beautiful chair of cardboard, we can keep in the showcase. But it cannot be used for sitting down. Therefore the first wisdom is that the whole world is like a cardboard chair. Don’t lean on it. Use it, but don’t lean on it. This wisdom is with regards to Anitya Vastu. And if I want to lean on something, if I want lasting support and security I should turn towards Nitya Vastu and Nitya Vastu alone. This refers to permanent or eternal thing. In Tattvabodha language, it is called Brahman. In religious or Puranic language, it is called God. Therefore the first lesson is God alone can give permanent security and support. World can give entertainment, education and opportunity. This understanding is called Nitya Anitya Vastu Vivekaha. The second qualification is called Vairāgyam. 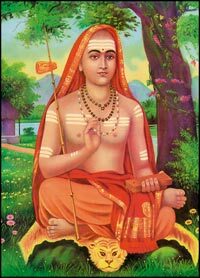 Vairāgyam is called dispassion. What is meant by passion ? Passion is clinging to the world for security and support. Psychological leaning on the world for security and support is also passion. Using the world for entertainment is not passion. Using the world for education, serving is not passion but leaning on the world for security and support especially psychologically, is called Passion. And having understood that the world cannot be relied upon for security and support, gradually withdrawing from this world or stopping leaning on the world for security or support is called dispassion. This does not mean running away from the world, nor rejecting but psychologically when I need security and support, I change the channel. I have both channels, World channel and God Channel. If I want entertainment and education, use the World channel, for security and support change the channel. This changing of the channel when I need security and support is called dispassion. Weaning myself away from the world which is born out of discrimination or understanding. Just like having two chairs – one is made of teak wood and the other is made of cardboard. Use one for decoration and the other for sitting. Use God and Use World appropriately. The third qualification is called Desire or Mumukshutvam. This is the desire for Freedom from the problems caused by depending on the world or Anitya Vastu leaning. World dependence causes lot of psychological problems. The first psychological problem is insecurity. This is because I am worried that whatever I am dependant upon will give way. And especially if it involves people, there is a constant worry of rejection. Those people who liked me, will they continue to like me permanently. Insecurity with regards to family or everything else, the basic problem will be insecurity, worry, fear, frustration, disappointment anger, hatred and in fact all psychological problems are cause by depending on the un-dependable, relying on the un-reliable. It is not the problem with the Anitya Vastu, but it is my mistake that I expected permanence out of impermanence. Wrong expectations are the problems. And the problems caused by the wrong expectations or dependences are called Samsāraha. Mumukshutvam means strong desire to be free from this Samsāraha . If this desire is not there, a person will travel from one impermanent thing to another impermanent thing, and again be cheated and frustrated. So when the person wants to get out of this mess, this is called desire for freedom or Mumukshutvam. The fourth qualification is called discipline or Shatka Sampattihi. Shatka means sixfold. Hence Shatka Sampattihi means sixfold inner discipline or personal discipline, self management before trying to manage others like the family, the company or the nation. And the six disciples are enumerated. Reduction of extrovert activities so that one will get some quality time for Self enquiry. Relaxed and stress-free pursuit. Finding quality time for withdrawal. Shraddhā means faith in the scriptures and also the Guru or Āchārya who helps in the study of the scriptures. By faith we do not mean blind faith but an open mindedness until I understand things clearly – hence a non-critical open minded approach giving the benefit of the doubt to the teacher or the scriptures until I understand. That humility, Shraddhā involves freedom from intellectual arrogance. Intellectual arrogance is a very big obstacle for scriptural studies. This means focussing capacity. The capacity to focus on the goal that I have undertaken. If it involves listening to a talk, my mind must be focussed on it for at least an hour. So concentration or focussing is that this refers. The above are the six fold discipline and all the above make up one qualification. All the four qualifications put together make up Sādhana Chatushtayam and this is the pre-requisite for Self enquiry. Tattvabodha begins with this statement only. The one who has got these four – at least 10 – 15 % - is called Adhikāri and he or she can alone benefit fully from Self enquiry, for others it will appear irrelevant or a waste of time or will merely appear as an academic exercise. The first three qualifications discrimination, dispassion and desire are acquired and nourished by Karma Yoga discipline. Karma Yoga is the most important discipline meant for acquiring the first three qualifications. The fourth qualification Shama Ādi Shatka Sampattihi. The fourth qualification is acquired through Upāsana Yogaha. Hence Karma Yoga and Upāsana Yoga together will give Sādhana Chatushtaya Sampatthihi with is preparation for Jnāna Yoga. Karma Yoga and Upāsana Yoga will make you fit for Jnāna Yoga. Hence Karma Yoga and Upāsana Yoga gives you Jnāna Yogyatā. Jnāna Yoga gives us Jnānam. And Jnānam gives you Mokhshaha. Therefore out entire spiritual discipline can be divided into two stages now. First stage is Jnāna Yogyatā Prāptihi – acquisition of Jnāna Yogyatā. This involves pursuit of Karma and Upāsana Yoga. And the second and final stage of life is acquisition of Jnānam – Jnāna Prāptihi. In the scriptures the first stage of Jnāna Yogyatā Prāptihi is discussed in the first part of the scriptures – Veda Pūrva deals with Jnāna Yogyatā Prāptihi through Karma and Upāsana Yoga. This portion is also called Karma Kāndam or religious portion. The entire religious portion or beginning portion of the scriptures known as Veda Pūrva deals with Jnāna Yogyatā Prāptihi through Karma and Upāsana. Whereas the last portion called Veda Antaha deals with Jnāna Prāptihi or the attainment of Jnānam through Jnāna Yoga. And this is not religious portion but is the philosophical portion of the scriptures. Thus the scriptures have got a religious portion dealing with religious life for Jnāna Yogyatā and a Philosophical portion for a philosophical life which is meant for Jnāna Prāptihi. Veda Pūrva and Veda Antaha – Vedanta is also known as Upanishad. That is because Vedanta puts an end to all the problems born out of wrong expectation. Upanishad means destroyer of dependence caused problems. Finally we will discuss one more aspect. We saw Karma Yoga gives the first three qualifications (Discrimination, dispassion and desire) and Upāsana Yoga gives the last qualification (discipline). In addition to Karma Yoga and Upāsana Yoga, one more exercise is included for acquiring Sādhana Chatushtaya Sampatthihi. Karma Yoga and Upāsana Yoga are not sufficient. One more is important – that is an ethical life in which a person follows moral values. A life of moral values is extremely important for cultivating Sādhana Chatushtayam. Mere Karma Yoga and mere Upāsana Yoga are not enough. Morality ethical values are also important. What are the ethical values. There are many ethical values highlighted throughout the scriptures. Of them, ten values are important. Without them, Sādhana Chatushtaya is impossible and without Sādhanā Chatushtaya, Jnāna Yoga is impossible and without Jnāna Yoga, Jnānam is impossible and without Jnānam, Moksha is impossible and without Moksha freedom is not possible. Without Freedom, you will then be a psychological slave of worries and tension etc. The ten “commandments” are divided into two groups. The first group consisting of five values in which you avoid five things. Sūna means unavoidable evil. And a householder will face many such problems and for him, Prāyaschittam is presented. The third one is Steyam Varjanam – Asteyam. Avoidance of stealing. Any illegitimate possession comes under stealing. Any benefit I acquire through an illegitimate deal is stealing only. Then comes Maithuna Varjanam. Maithunam means inappropriate sexual relationship in thought, words and deed. Varjanam means avoidance. The above are the five avoidances. Then there are five positive things to be followed. The second is Santoshaha – means positive contentment with whatever I acquire through legitimate methods. This does not mean neutrality saying “OK fine”. I am happy. The third is Tapaha or Tapas. Any self denial practiced for master over one’s own instrument. E,g, fasting, maunam – any vow taken where I deny certain comforts for self mastery. Tapas is austerity or self denial. The fourth is Svādhyāyaha – scriptural study is very important. The fifth Īshvara Pranidhānam – surrender to the Lord by which accepting every experience as a Karma Phalam which is coming as a gift from God. Without resistance accepting every experience and not allowing the experience to generate negative emotion. That acceptance is called surrender to God. These are the five positive ones. The first five are called Yamaha. The second five are called Niyamaha. Yama + Niyama are the ten commandments which is the moral or ethical life. Karma Yoga + Upāsana Yoga + Ethical life will give Sādhanā Chatushtaya. If we have this, we are ready to go into Tattvabodha.